Our monthly lecture and practical meetings are held at Coleshill Village Hall. 3rd Wednesday of month - starting at 8pm. 1st Thursday of the month - starting at 8pm. Coleshill Village Hall is just off the A404 between Amersham and High Wycombe in Buckinghamshire, and the A335 between Beaconsfield and Amersham. See directions and maps below. Turn right into New Road, at the sign post for Coleshil!. At the triangle turn right into Village Road (not Hill Meadow). After half a mile, at the Church, turn right into Barracks Hill. The Hall is on the right, after about 50 Yards. Car parking is outside the hall and across the road from it. Our observing sessions are held, weather permitting, on an occasional basis in our observatory - see sketch map. Sessions are normally announced on the Forum or via Twitter. 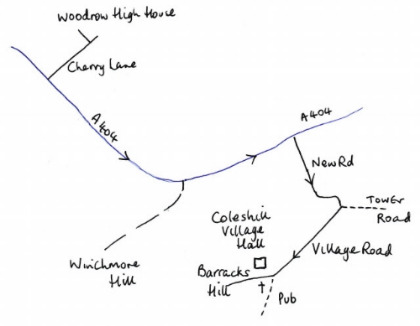 Woodrow High House is just off the A404 between Amersham and High Wycombe in Buckinghamshire. Exit the M40 at junction 2 and follow signposts to Beaconsfield and Amersham. Get onto the A355 at Beaconsfield and follow until you come down a steep hill into Amersham. Turn left at roundabout onto the A404. Follow the A404 past the Crematorium and a long right hand bend. Just as you pass underneath electricity pylons look for a signpost to Woodrow. Turn right into Cherry Lane. Woodrow House is 250 metres down on your left. Leave the town centre and head for the Amersham Hill. Go through Hazlemere on the A404. Follow the A404 past the turning for Penn and Holmer Green. Look for the signposts to Woodrow on your left. The observatory is in the field on the left hand side just before the car park and the house.